The Cruiser OLYMPIA published a ships newspaper that actually served the entire squadron. 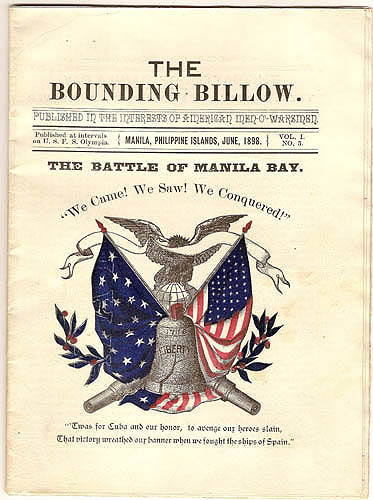 This page provides on the issue that covered the Battle of Manila Bay. Below is the front page of an original copy the June 1898 issue of the OLYMPIA's ship newspaper, the Bounding Billow. The newspaper's editor, Louis Stanley Young was only an apprentice first class, who worked out of an improvised press room in either the forward or aft torpedo room of the ship. He produced the newspaper, writing most of the copy and apparently doing the typsetting. 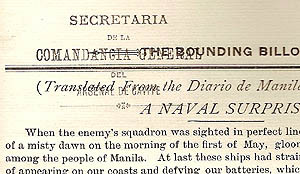 His June, 1898 issue gives sparse first-hand accounts of the battle from the viewpoint of the crew, as well as an account taken from a Spanish newspaper in Manila. Additionally, the newspaper included poetry, and general squadron news. Though the conditions under which the publication was prepared was cramped and primitve for a printing standpoint, the result was quite professional. The map prepared for the publication was an engraving which was made with "two sail needles." "We were delayed by a lack of paper and only through the kindness of a few of our shipmates who brought us some which the Spaniards left on evacuating Cavite, are we enabled to print this issue. We take this as an opportunity to thank them. Well 'tis an ill wind that blows nobody any good;' the fact of the 'Bounding Billow' being printed on captured paper will certainly enhance its value as a memorial of this occasion." As evidence of this, some of the sheets actually have red lines from column ledger marks, and one page is actually overprinted on a form from the "Secretaria de la Comandangia General del Arsenal del Cavite." All pages are watermarked in Spanish with "1A "surrounded by a shield, the words "F. Paya," and part of a coat-of-arms. This original copy was believed to have been mailed home by some unknown crewman to the office of Samuel W. Reeves, a prominent Philadelphia attorney. "P A Y" can be seen, running vertically. overprinted on the letterhead of Secretaria de la Comandangia General del Arsenal del Cavite. Young, Louis Stanley, (Editor), Bounding Billow.